Trimble Funeral Homes) Grave marker for Laverne Peterson in Plot W-108 of the Rock Island National Cemetery, Rock Island (Rock Island County), Illinois. Laverne enlisted in Peoria, IL on Feb 16, 1943 and was transferred to Co F, 508th on August 8th of that same year. He was wounded in action on July 6, 1944 in Normandy. Pfc Peterson spent the next 6 weeks in a field hospital before being transferred to an unknown hospital, probably in the U.S. and did not return to the regiment. Laverne Peterson, 84, of rural Cambridge [IL], died Sunday, Dec. 21, 2008, at the Clarissa C. Cook Hospice House, Bettendorf. Funeral services will be held at 10 a.m. Wednesday, Dec. 24, at the Cambridge Chapel of Stackhouse-Moore Funeral Services. The Rev. John Eisfelder will officiate. Burial will be at National Cemetery, Arsenal Island, with military services by the Colona American Legion. Visitation will be from 5 to 7 p.m. today at the funeral home. Memorials may be made to the Laverne Peterson Memorial Fund. 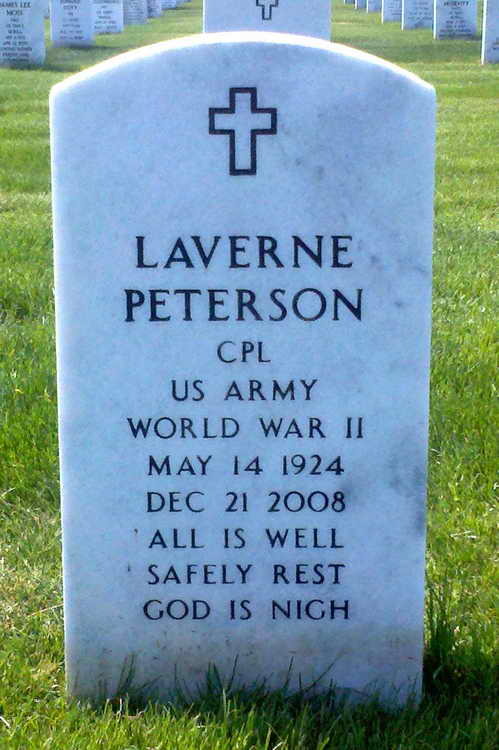 Laverne was born May 14, 1924, in rural Lynn Center, the son of Raymond and Signe Larson Peterson. He was educated in Galva schools. Laverne was in the U.S. Army during World War II, serving in the European Theatre. His marriage to Betty Nimrick took place on Oct. 19, 1947, in Rock Island. She died on May 16, 2006. Laverne spent several years as a heavy equipment operator for Marlin Laity in Silvis. He then started his own heavy equipment/trucking business, which he operated until retiring in 2007. His hobbies were traveling, fishing, and enjoying each day for what it had to offer. He was a member of the Bishop Hill Community United Methodist Church, the Colona American Legion Post 1233, and the International Operating Engineers. Survivors include three daughters and sons-in-law, Dyann and Dave Roby, Muscatine, Iowa, Barb and Brad VanDeVeire, Cambridge, and Sharon and Gail Wexell, Bishop Hill. Also surviving are nine grandchildren, three stepgrandchildren, 16 great-grandchildren, and two stepgreat-grandchildren. Other relatives surviving are two sisters, Margaret Zimmerman, Colona, Dorothy Mahaffey, Hannibal, Mo. ; a half-sister, Linda Peterson, Moline; and a half-brother, William Peterson, Moline. His parents, a sister, and four brothers preceded him in death.